Replace the stock stamped brace that came on your car from the factory with our Pro Series Chrome Moly Panhard Bar Brace. 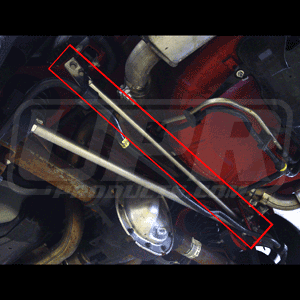 This brace is made specifically for the 2005-2014 Mustang GT as an upgrade to the stock bar that is stamped and not made to handle heavy abuse at the track. Designed to replace the stock brace and made from Chrome Moly tubing, tig welded in a billet fixture for a perfect fit every time and powder coated silver for a long lasting finish. 2005 2006 2007 2008 2009 2010 2011 2012 2013 2014 V8 GT GT500 Boss 320 5.0L Coyote Mustang Steeda Roush & Saleen Vehicles. No one else can stack up to the bold clean styling of our aftermarket Billet dress ups, Street Strip & Racing Suspension & Performance Parts for your late model American Muscle Car!